The affordably priced Griffin Drafting Chair features a uniquely styled mesh back that is airy, comfortable, and adjusts for height and depth. A pneumatic control adjusts the chair height from 23" to 33" (58 cm to 84 cm). The ergonomically contoured, molded foam seat measures 17"W × 17"D (43 cm × 43 cm) and is 3" (8 cm) thick. 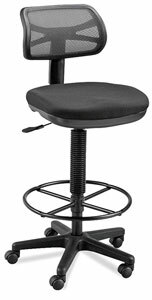 The Griffin's reinforced nylon base measures 25" diameter (64 cm) and features an 18" diameter (46 cm), height-adjustable foot ring and dual-wheel casters.